Marine Mammal Ecotoxicology: Impacts of Multiple Stressors on Population Health provides tactics on how to develop a comprehensive methodology for the study of existing threats to marine mammals. By presenting a conservation-biology approach and new and emerging technologies, this work helps provide crucial knowledge on the status of marine mammal populations that not only helps readers understand the ecosystem’s health, but also instigate mitigation measures. 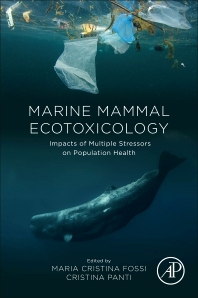 This volume provides information that helps investigators unravel the relationships between exposure to environmental stressors (e.g., climate change, pollutants, marine litter, pathogens and biotoxins) and a range of endpoints in marine mammal species. The application of robust examination procedures and biochemical, immunological, and molecular techniques, combined with pathological examination and feeding ecology, has led to the development of health assessment methods at the individual and population levels in wild marine mammals. 17. Marine mammals and multiple stressors, implications for conservation and policy. Maria Cristina Fossi is Associate Professor of ecology and ecotoxicology at the University of Siena, Italy, and since 2000 has been Scientific Director of the Biomarker Laboratory (CIBM). She gave a key contribution to the development of the biomarker approach in terrestrial and marine ecotoxicology. Thanks to her work on non-destructive biomarker on skin biopsies, since 1991 she has been a world reference for the assessment of ecotoxicological risk in cetaceans. Since 1994 she has developed innovative diagnostic tools for ecotoxicological assessment of threatened species (marine mammals, birds, reptiles) bringing about the establishment of methods (non-destructive biomarker approach) currently acknowledged as the gold standard at the international level. Her research group supports the anti-whaling activity within the International Whaling Commission (IWC). In 2001 she published the first papers on effects of on Endocrine Disruptors (EDs) in Mediterranean marine top predators (pelagic fish-swordfish- and cetaceans) and long-living organisms (sea turtles). In 2012 she provided the first evidence worldwide on the effects of microplastics on Mediterranean cetaceans. She is author or co-author of more than 550 original papers (articles, review articles, chapters and books). She has been coordinator of more than 25 national and International research projects. She is involved in several international scientific organizations (e.g. Past-president of SETAC Italian Branch). With a notable ability to involve young people in research and conservation activities, her research group is composed by 2 senior researchers, 2 post-Docs and 4 PhD students. She has been a panel member for evaluation of projects for EU Commission (e.g. BONUS) and international institutions (e.g. : MISTRA, Barcelona Convention, CIEMS). She is associate editor of Environmental Pollution, and is involved in intense scientific communication and dissemination activity (media, magazines, web, film) about the ecotoxicological effects of contaminants in Mediterranean fauna, and in particular on the effects of plastic and microplastics and in cetaceans and sea turtles. Cristina Panti (PhD 2009) is a post-doctoral fellow at the University of Siena. She has expertise on molecular (gene expression, genetic analysis) and ecotoxicological investigations for the assessment and monitoring of cetaceans and top predators’ health, developing innovative methods and the effects of plastic on marine fauna. She has participated in several projects including: “Toxicology of dolphins in Queensland” with Southern Cross University (Australia); Bilateral Cooperation project IT-MX with UABCS (MX); and “Effects of microplastics on fin whale from Pelagos Sanctuary”. She has been a visiting fellow at the Woods Hole Oceanic Institution (USA) and the University of Groningen (The Netherlands). She has authored multiple papers in peer-reviewed journals, chapters in books, and more than 40 conference proceedings . Her well known research group has been involved in national and international research projects concerning development of non-destructive biomarkers on sea-birds, sea turtles, and marine mammals worldwide for endocrine disrupters, bio-monitoring of industrial activities, and study of macro/microplastics in Mediterranean Sea. The lab has a central position for research on marine litter on Mediterranean Sea and a key role in the implementation of the EU MSFD at national level (D8-D10).